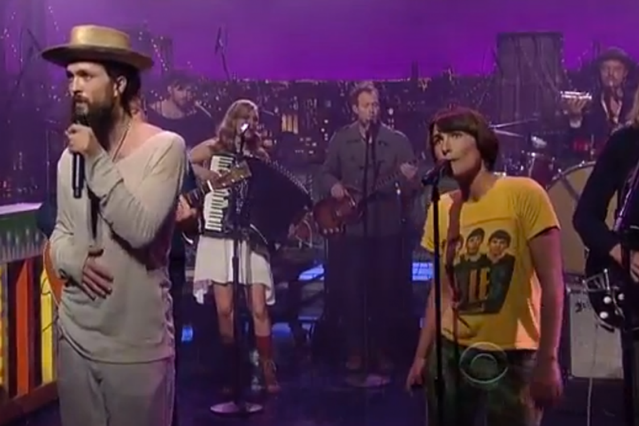 “A lot going on,” David Letterman enthused after Edward Sharpe & the Magnetic Zeroes’ performance last night on Late Show. “A lot of music.” The late-night TV host wasn’t wrong: As a live proposition, “Man on Fire,” from from the band’s upcoming sophomore album Here (out May 29 on Vagrant), turns into an enthusiastic exercise in old-timey gospel-folk maximalism. Frontman Alex Ebert asks the world to dance with him, his “fire” and “desire” intonation evoking a bit of Johnny Cash; then he goes out into the crowd to dance with the world. There are so many instruments on stage that one appears to be a didgeridoo. All that’s missing, in fact, is smoke. Check out our interview with Ebert about new album Here, um, here.